Fallout notes that you can already book your room at the Ramada, and the rooms are starting at $110/night for a Single Queen as noted on the venue page, but at this time you can only book over the phone. Also, if you're an early bird who has already booked time off for this event, double-check your calendars as the dates have changed! The header on fureh.ca has yet to reflect the correct dates, but we can expect that to happen soon. Also, VOTE PIE! The cake is a lie. Are you the kind of snowbird who likes to travel south during the summer? The Memphit Fur Meet may be a place for you to go and chillax! It's being hosted at the Olive Branch in Mississippi, just outside of Tennessee! The theme this year is "A night at the movies", and each day at the con has it's own sub-theme! Saturday: Killer Furries from Outer Space! Mephit Fur Meet, or simply MFM, is a furry convention held every year since 1997 over Labor Day weekend in Memphis, Tennessee. What started off as a pizza party over a long weekend has turned in a full blown fun time drawing nearly 700 people from all over the United States and the world. If you're heading there this summer, have fun! Camp Feral! is 'the' furry summer camp where one registration fee covers your food, lodging and activities for the most unique and memorable furry experience of your life! You register, we handle the rest: all the coffee (tea and hot chocolate) you can drink, all the breakfast lunch or dinner you can eat, and usually a birthday cake at camp each year too! Camp Feral! Creating wild memories since 1998! News New License Plates for Alberta - Vote by August 19th! 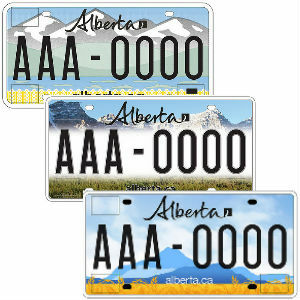 Alberta is getting a new licence plate. The plate will feature a new design, Alberta's website address and new logo, and a reflective coating that will help make roads and communities safer. Alberta’s current licence plate has been in use for almost 30 years and the technology is out of date and no longer meets industry standards. New technology makes plates easier to read, so law enforcement can more easily identify unregistered, uninsured or stolen vehicles. At the end of the day, these new plates will make Alberta’s roads safer. Admin Notice Looking for Editors! Help drive AF's community with activity! - Content can be Furry-related or local news-related that's non-furry (but perhaps very important to Albertans), but try your best to keep it furry! - If the event if a more of a private event (Such as Luci's Meat & Greet, for example), ask the event hoster for permission if they wish to have their event featured on the main page. - To add a story to the main page, simply create a thread in "Editor's Lounge" on the forums, and the main site will update itself automatically. The first image posted inside the thread will become the headline's primary image. - You are not to advertise anything else aside from news/events. If unsure, contact me personally via PM. While Editors will have a special badge on the forum, it must be noted that Editors are not part of Alberta Furries staff, and have no additional privileges on the website aside from the added ability to create threads in the "Editor's Lounge". However, anyone on AF staff can act as an editor already. If you think this is up your alley, please shoot me a PM! We have added a news portal to our website! This will soon become the default index page for the site, and it will list all the latest administrative announcements as well as events/news from SOON-TO-BE EDITORS! As a guest, they will see all website updates and Editor posts from the new "Editor's Lounge"! If you are logged in, it will also show the last 3 recent posts on the forum at the very top. This to keep the main page fresh and updated with content, as prior to this update, new users would visit the site and be greeted with...wait for it...NOTHING! That's right. Literally every forum is otherwise blank to unregistered users, which means they could potentially not sign up if there's nothing to see. I aim to change that, and I'll require the communities help with that! Information about Editors will be posted on a follow-up announcement. Zilch and myself have looked through the applications we have received so far and have picked three new staff members. We are still looking for another 2 - 3, so please let us know if you are interested by following the application process. We will be updating their status's today. Again we thank everyone who has applied and those yet to apply and we will continue to go through the lists to narrow down the applicants. This needs to be noted, the position is voluntary, you won't be paid. Additionally, we prefer Albertans for real-life staff meetings, etc., but this isn't mandatory of course. Why do you want to be on staff? What do you believe you can help in regards to contributing to staff? What's your availability, and how active are you on the forums? Please note that account infractions are taken into consideration when we select staff. I think I've got everything covered! If you have any questions, feel free to ask us either in this topic, or via PM! Cut off for Applications is April 15th. Anyone left who had some sections disappear from them from the last few days and hasn't contacted me should now be fixed. I applied a mass-update to 447 Alberta Furry accounts that should fix the remaining people out there! I spot-checked permissions on numerous user's accounts to ensure that all went smoothly and it should be fine, so I don't expect any issues, but in the very slight chance that someone's permissions are still mixed-up, please PM me and I'll help you get that sorted. Please note this only applies to anyone who has a post count of 1 or higher. Anyone with a post count of 0 will still need to make an introduction thread. - User avatars displayed on forum home display as the last-posted user. - "New Posts" at the top, to help promote forum activity. Sorry for the inconvenience, and I hope everyone has a good day! Just a small security update in regards to new users. To prevent lurking users, I've now set the forums up in a way that forces all newly registered accounts to make an introduction post in the introduction forum before the forum grants them any permission to see anyone's profiles, other forums, events, etc., however they will have shoutbox access right off the bat.